I've begun creating "mini" pencils. 4 1/4" (including eraser) it is quite a bit smaller than the original PaperMate Write Bros pencil. The mechanical pencil was disassembled and the barrel tossed. Using a very sharp bench chisel and just hand pressure I cut the mechanism down to 2 7/8". This also required shortening the leads by approx 1/4". 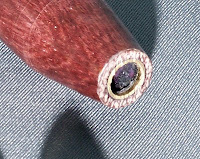 The barrel is made from purpleheart. I drilled a 1/4" hole through it and turned it on a standard pen turning mandrel. (1/4" hole fits the mandrels made to be used with 7mm brass tubes.) The barrel is 2 5/8" long. The mechanism from most click-type mechanical pencils requires a small lip at the tip end of the barrel. I created that lip by gluing a tiny piece of 1/4" brass tubing into the tip. It is around 1/8" long, the longest I could make it and still have the threads of the mechanism protrude enough to catch the plastic tip from the original pencil. The close up shows the piece of tubing used. Note that I used 1/4" tube NOT the standard 7mm tubing. 7mm tubing isn't narrow enough to stop the mechanism. The finish on this one is just some CA glue slapped on with a small plastic baggie wrapped around my finger. No effort at properly finishing this pencil was made because I was in a hurry. So no comments on the poor finish, OK? 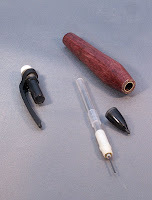 The Write Bros pencils make perfect practice parts for experimentation because they are inexpensive and easily modified. They are not terribly durable since they're all plastic, but are still useful. And at approx 30c a piece, if one breaks, or I screw it up, I'm not going to cry. The one pictured here was given to my 5 year old daughter. She loves it and has been using it heavily since I gave it to her. So far it's holding up well.